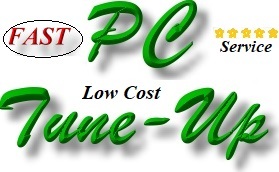 ﻿ Upgrade Slow Computers, Repair Slow PCs, Slow Computer Tune Up, SATA1 upgrade, SATA2 upgrade. There are many reasons that a PC (Personal Computer) or All in one PC will run slowly. Slow computer performance can be caused by a virus or malware. 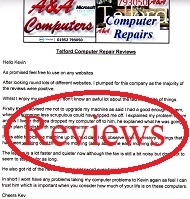 When a PC runs slowly because of a virus or malware, the Fast solution is often to backup all documents, scan the documents with high quality anti virus computer software and anti malware computer software, completely erase the infected hard disk drive or SSD (Solid State Drive), perform a full Windows re-installation and install quality anti virus software. Slow computer performance can be caused by a faulty or "full" hard disk drive or SSD. Computer data and personal documents are usually stored on the PC hard disk drive or PC SSD. Therefore; if the drive is faulty or full, the computer will run slowly because it will need to repeatedly search for data. If the PC runs Windows from a hard disk drive (99% of PCs do), the solution would be to install a larger - Faster hard disk drive or install a PC SSD (SSD is inherently much Faster, quieter, cooler, more reliable and uses less power than a hard disk drive). Please note that most PCs require an adapter in order to fit an SSD. In many cases, Slow PCs can be transformed by fitting an SSD as the "Boot drive", fitting the original hard disk drive into the same case and using it to store data. However, most PCs will use onboard Hard Drive connections (SATA cables). The hard drive connection will usually be SATA1, SATA2 or SATA3. These connections run at different speeds. SATA1 can transfer data at 150mbs, SATA 2 can transfer data at 300mbs and SATA 3 can transfer data at 600mbs. Since 100mbs = 1gb (1Gigabyte) per second transfer speed, this means that a SATA 1 connection can transfer data at 1.5gb per second. Therefore most SSD drives will not operate at their full potential without an adapter (which would typically fit into a PCI-E (PCI Express) slot). Slow PC performance can be caused by outdated software. Computer software often requires periodic updates. However, if the manufacturer no longer supports the software, this will often result in a slow computer because it is compelled to continuously or regularly search for software which is not available. Slow PC performance can be caused by faulty memory or a lack of memory. Please imagine that a computers memory is an empty bucket. When the computer loads Windows, this will partially fill the bucket (in some cases leaving only a quarter of the bucket empty) and every time that a program (app) is run, or data is loaded, this will result in less space in the bucket for programs to be run or for data to be accessed. Quite often, this will result in the PC repeatedly saving data to the hard disk drive or SSD in order to free space in memory. The solution is to increase the capacity of "the bucket" - increase the computer memory. As a rule of thumb; the more memory the better. However, fitting memory which will never be used is pointless. Please note that all PCs require specific types and specifications of memory, and they have a limit to the amount of memory which can be fitted. Also; processor can impose limits and operating systems impose limits. Eg;32bit versions of Windows tend to impose a limit of approx 3.5gb. Slow PC performance can be caused by a slow Graphics chip or a lack of graphics memory. Computers tend to have two main processors. These are a CPU (Central Processing Unit) and a GPU (Graphics processing Unit). The CPU is basically the computer brain, whilst the GPU s dedicated to displaying video (graphics). PC GPU`s are often (but not always) built into the main board (known as the motherboard) and usually cannot be upgraded. Additionally, the GPU can use dedicated memory (which is allocated from the main pool of memory (as discussed above). Many manufacturers allow dedicated computer graphics memory to be increased from within the BIOS (setup). So, if increasing the laptop memory it may also be advisable to allocate additional memory to video (graphics). Micro PCs or PCs with an Atom CPU, the GPU often cannot be upgraded. Most standard PCs, slim PCs (Small form factor PCs) and some all-in-one PCs provide an upgrade slot (usually a PCI-E slot) into which a dedicated graphics card can be fitted. A dedicated graphics card will replace the original graphics chip and will typically be much Faster. Additionally it will usually run Faster - dedicated graphics memory. This will have an additional benefit of freeing PC memory which was previously allocated to graphics. However, graphics cards are available with various amounts of build in memory, some PC graphics cards will not fit into slim-line PCs etc, some graphics cards require an additional power source, there are compatibility issues with different cards and different PCs and different versions of Windows and there can also be heat or noise related issues - some graphics cards come with cooling fans (which require power and create noise), some graphics cards use a radiator rather than a fan (but will require sufficient ventilation).